Unable to pay the ambulance drivers INR 1500, or around USD 22, a young mother was forced to sit out the night with her child’s dead body outside a hospital in Uttar Pradesh’s Meerut district. This happened less than two weeks after a nationwide outrage over the ordeal of a tribal man named Dana Majhi thousands of kilometers away, in Kalahandi district of Odisha. 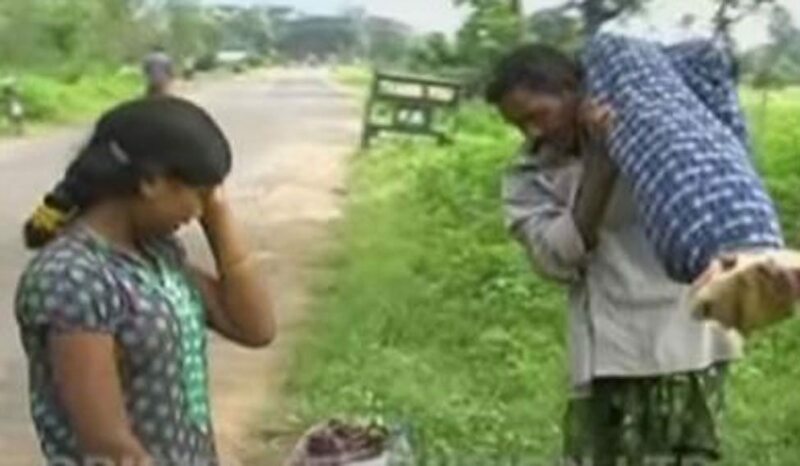 Refused ambulance service to carry the corpse of his wife back to his village because he had no money, Mr. Majhi had to carry her on his shoulders, with his minor daughter in tow. Sadly, the Meerut case was not the only one to happen since. Salamani Behera, an 80 year old woman, was run over by a train in Soro. As mandated in every accidental death, the staff of Soro Community Health Centre (CHC) needed to send her body for post mortem to the district hospital in Balasore but they could manage no ambulance. Unable to pay for alternative transportation, and forced by the setting in of rigor mortis making the body stiffer and stiffer and therefore difficult to carry, the staff broke the body at the hip, wrapped it in an old sheet, tied it to a bamboo pole. They then carried it to the railway station from where the body was taken to district hospital by train. Even this is not it for the country that claims to be the largest democracy of the world. In another case in another state, a crematorium in Neemuch of Madhya Pradesh did not allow Jagdish Bhil, a tribal man, to cremate his wife as he did not have the required money- INR 2500 or around USD 37. Disgusted, he collected garbage- waste paper, plastic bags and whatever else he could find, made a pyre of that and cremated his wife. The ordeal of Dana Majhi had shook the nation, or at least it seemed so. The remaining three went largely unnoticed. The shock value of such things happening in a country claiming to be on track to become the world’s next super power was perhaps spent with the first. Or it did not, the democracy and its more fortunate citizen knew it all along. Who does not know the state of affairs in public hospitals across India, after all? Who, further, can really be unaware of the real status of the thousands of welfare schemes- hadn’t the Supreme Court of India lambasted the union government for the ‘woeful implementation of wonderful schemes’ less than a year ago! Let’s look at the cases closer. Easy way would be to blame the lowest rung staffers- the hospital staff which refused ambulances Majhi and Meerut lady, the ones who broke the dead body of Salamani Behera by the hip. That is how the system works, by finding scapegoats. But are they really to be blamed? Are they allowed to spend from some contingency funds for such eventualities? And if not, which is the case, they would be simply unable to pay from their already meagre salaries. That is, again, if they are not from contractual staff as is mostly the case in the new economic regime. The workers at the MP crematorium would definitely be even worse off- from marginalized castes, working for some contractor for a pittance. Where does the blame really lay then? Dana Majhi’s case sheds light on that. The government of Odisha had two schemes to help poor and destitute families in cases of death of a member. The first of them, Harischandra Sahayata Yojana was launched in August 2013 to assist families monetarily to conduct last rites of the deceased. Following up on this, the government of Odisha has declared another 'Mahaprayan Yojana' to provide free transportation of dead bodies of family members of the poor and the destitute in February this year. Yet, Mr. Majhi had nothing to bank upon to on the ground as the scheme was only ‘declared’ not ‘launched’. The fact that the Chief Minister Naveen Patnaik launched it the day after outrage over Mr. Majhi is a telling comment on how these schemes work in fact. Further, Mahaprayan Yojana wasn’t the only government scheme that did not reach Mr. Majhi. Indian Express, an Indian newspaper later reported that Mr. Majhi was not paid for the work he did under Mahatma Gandhi National Rural Employment Guarantee Act (MGNREGA) in October 2015. He would not have been forced to carry the body of his wife on his shoulders had he been paid his dues of INR 4,064 perhaps. As he was not, he had to borrow money to take his wife to the hospital and then spend on tests, medicines and everything! Going by the schemes in force, he should not have been forced to pay any of that though. He should have been covered under Rashtriya Swasthya Bima Yojana, an insurance scheme for the BPL families covering health expenditures up to INR 30,000 in any hospital, public or private. He was not enrolled in that too. He should not have been made to pay all that he was, Rs 300 for blood test, Rs 200 for medicines, Rs 100 for registering his wife’s name and Rs 10 for getting a seal on the papers, as Indian Express added, as the user fees in Odisha government hospitals are in fact much lower, as one can see here. Evidently, Mr. Majhi was a double victim of the system. Of getting denied of what was legitimately his first and then forced into bribing to get even something as basic as medical care. One can bet that similar would be the circumstances in all the cases mentioned above. Poor people, citizens of the country, would be denied the benefits of the schemes made for them. They would have nowhere to go to seek redress as the system would be infested by vested interests feeding off their lives. Failed by the authorities’ oath bound to protect their lives- with dignity- they would most often have no support from civil society and media either. The vicious cycle end in lost lives- their own or of kith and kin and then they would be discriminated against and disgraced even in death as one can see in the all the cases here. It is just that their ‘stories’ did not start at the death that somehow got them what they never had- attention to their otherwise invisible and dehumanised existence in a country all set to become a superpower. Death, after all, can only be a culmination of the injustices inflicted on them all their lives. The injustices would begin with no functioning nutrition security for the poor that would push them into a vicious circle of poverty-malnutrition-wasting/stunting-unemployability-even more poverty. Almost non-existent primary health care would then add to this by failing to take care of even the most easily avoidable and curable diseases that affect the kids of the poor. It would then continue in the form of the BPL cards denied to the needy, the bribes sought for that Rs 500 a month mention for destitute elderlies, the ration stolen as a cut by the Public Distribution Shop owner, the public health centre never visited by the doctors posted there, the free, government ambulances that would never reach them because of deflated tyres and what not. It would continue as there would be schemes but hardly any monitoring on the ground. This would continue because there would be no avenues to seek redress against any of that. It would continue as the media would rarely reach them in the countryside- so distant from its glossy studios and offices in the metros- unless there is a disaster like flood or drought. The list can go on and on but the point is simple. That their stories do not begin at death- more so in such undignified conditions. They begin much before and nothing much would change unless one goes all the way back and starts putting things in place from the beginning. The problem is that the system, welfare system in particular, itself has turned into a skeleton and requires a complete replacement with a living and functioning one. No overhauls can put life back into skeletons, can they?